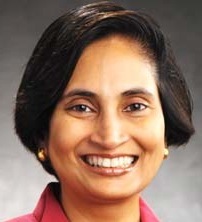 The VAR Guy must concede: He wasn't overly impressed with former Motorola CTO Padmasree Warrior (pictured) when she presented at a municipal wireless event back in 2007. She gave a classic product pitch instead of a thought leadership presentation. The VAR Guy must concede: He wasn’t overly impressed with former Motorola CTO Padmasree Warrior (pictured) when she presented at a municipal wireless event back in 2007. She gave a classic product pitch instead of a thought leadership presentation. Fast forward to the present and Warrior — now CTO of Cisco Systems — is talking vision instead of products. And it’s a welcome improvement. Today, she offered up a preview of voice-enabled search. Should Google worry? Warrior’s keynote continues right now. But so far, so good. Clearly, John Chambers’ public speaking coach has been spending some time with Warrior, and it shows. Future of Work: Cisco and partners will focus on inter-company collaboration, mobile experience, clusters of experts and millennials. Voice, data and video must be integrated with consistency and interoperability, she notes, in order to drive the future of work collaboration. Future of Connected Life: She noted trends like Internet mobility, video, content sharing (vs. owning) and lifestyle optimization. And she pointed out that the Flip video acquisition was not about the device. Rather, it’s about the architecture of tying the video content back to shared experiences. Future of Computing: Warrior pulled up a classic chart showing the mainframe, microcomputer, client server, web and cloud eras. She pointed to virtualization as a disruptive force that set the stage for the cloud age. Warrior then launched into an overview of Cisco’s architectural play and launched into a demo. It including voice-enabled search, tied to health-care telepresence and near real-time language translation.